Growing up in a family of physicians, I was intrigued by the medical field and the healing arts. I also always had an incredible love for animals, often surprising my mother with dogs I befriended on my walk home from school. In my home country of Moldova, I decided to combine my love for animals and my interest in the healing arts and become a Doctor of Veterinary Medicine. As a second generation acupuncturist, I was first inspired by Traditional Chinese Medicine (TCM) in my teenager years. My father, who was the Chief Doctor in the Infectious Diseases Department of Basarabeasca Hospital as well as the TCM practitioner, relied on acupuncture to help me overcome multiple health issues ranging from the common cold to severe sports injuries. In 2000, I began a daily Vipassana Meditation practice that has since led me to fulfilling my dream. This daily practice paired with my medical background, family heritage, and interest in holistic medicine led me to a path of becoming a Doctor of Oriental Medicine. While in school, I apprenticed with the lead professor from University of East West Medicine (UEWM), visiting his private office daily and learning his unique and effective style. After receiving a Masters of TCM, I passed both the National and the California State TCM Practitioner Board Exams, being the only student in my school year from the English language program who became licensed. 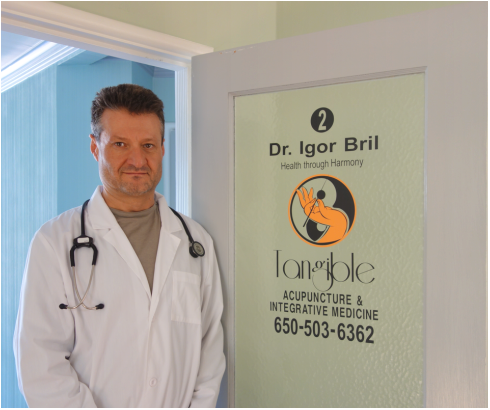 I continued my education and graduated with the Doctorate degree in Acupuncture and Oriental Medicine (DAOM) expanding my expertise in Oriental, Integrative and Functional Medicine. I'm living my dream of sharing my knowledge of safe, natural, drug free, and effective healing techniques with my patients. My never-ending drive to learn effective healing techniques led me to completing the arduous 13th months Sport’s Medicine Acupuncture Certification Program with Matt Callison, one of the world’s premier sport’s medicine professors. I became certified in Sports Medicine Acupuncture™ where I mastered my knowledge of human anatomy, postural imbalances, injuries and movement patterns of the spine, neck, shoulder, hips, low back and extremities. as well as diagnoses and treatments for orthopedic conditions using advanced anatomical based acupuncture, myofascial release techniques and exercises. It is with great honor that I am able to apply my knowledge and practice of Sports Medicine Acupuncture™ to heal and help my patients in a safe, natural, drug free, and effective manner. I have been perfecting and enhancing a style of acupuncture I inherited from my father, referred to as Tangible Acupuncture, where diagnoses are based on palpating acupuncture channels that lead to more precise and effective point location and selection. Once a point is needled, I make a direct connection through my hand to the patient via the needle, thus tangibly manipulating a patient’s Qi to heal the body. In my practice, I get to know my patients, combine all modalities of the TCM, my medical background and knowledge of Western medicine to ensure that my patients receive the best support for their condition. I provide dedicated attention, top-level service, health and lifestyle coaching, and a truly personal experience to each individual that walks through my doors. I enjoy spending time with my family and living an active lifestyle. During the summers, I’m an avid swimmer and in the winter, I’m a ski fanatic. In the time between, I love to explore Lake Tahoe and the SF Bay Area by going on hikes, an activity introduced to me by my daughter. When at home, I practice Qi Gong, Vinyasa Yoga, read the latest acupuncture and medical discoveries and enjoy the relaxing presence of our family cat. Traditional Chinese Medicine is my passion and I am lucky to have the opportunities to expand my involvement with it outside of my office. I am a teaching professor at the University of East West Medicine, teaching Acupuncture and Practice Management. I am also a Medical Qi Gong Practitioner, sharing my knowledge via weekly classes for the public that empower students with self healing techniques they are able to practice at home. It is a joy to share my passion and I am looking forward to continuing learning TCM throughout my own life so that I may continue to share it with others.